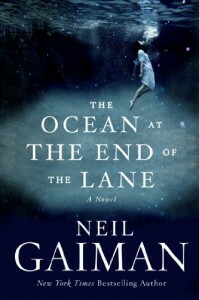 Neil Gaiman takes us on a moving and fantastic journey, through the mind of a middle aged man who's returned to his childhood home while back in town for a funeral, and his visit to the old Hempstock farm at the end of the lane. Though most all of the housing and landscape has changed significantly over the intervening decades, the old Hempstock farm stands just as he remembered it. It's as if time's stood still down that narrow lane... past the brambles and briar roses, the hazels and the wild hedgerow. At the farm, our protagonist is greeted by Old Mrs. Hempstock, who informs him that his old friend Lettie isn't available but invites him to sit by the duck pond for a spell nonetheless, and he fondly recalls how Lettie used to refer to the duck pond as an Ocean. As he sits and reflects, an entire sequence of events passes before his eyes, as if it all happened only yesterday. He's brought back to the time a few days before he meets eleven year old Lettie Hempstock and the rest of her strange and unusual family. When one of their boarders commits suicide, an odd chain of events is set into motion, beginning with the appearance of a peculiar woman named Ursula Monkton whose only desire is to grant the people of town all that they desire. But we all know the saying to be careful what you wish for, right? The three women of the Hempstock farm—young Lettie, her mother Mrs. Hempstock, and grandmother Old Mrs. Hempstock—each possess curious skills of their own, and endeavor to right the wrongs committed by the unnatural being. Though they claim not to do "spells", the three Hempstock women appear to represent the Triple Goddess—Maiden, Mother, and Crone—and the workings they perform are of a magic older than time itself. There were many other Pagan undertones to this story that delighted me equally, one of the foremost being how when Lettie was injured, she was returned to the Ocean for the water to heal her. This story was deep and moving on so many levels that it sits with you awhile. Even after I'd finished reading, I found myself contemplating something that occurred and then proceeded to see it in an entirely new light. A day later and some of the more subtle nuances of the story are coming to me even now. A wonderful adult fairy tale I can wholly recommend to any fantasy fan.